We first met with Heather and her adorable sister Jacky last August. With a love of everything and anything vintage, antique and "old" as she always said, Heather was primarily looking for assistance in transcending her ideas through paper and statement blooms the day of. Yes please! With the fabulous back-drop of Lord Thompson Manor, it felt like total serendipity and were were tickled pink (no pun intended) to be part of her big day. Two weeks before my due date, Heather and I took a trip throughout the tri-state area in search for the perfect florist. From the moment we walked into Stoneblossom's Studio and saw our inspriation book on the coffee table, we were sold. Living up to their spectacular reputation, Stoneblossom was top notch in every sense of the word from planning to execution. Kristen, we can't thank you enough for your kindness, flexibility and swoonworthy flowers!! Talia did a fantastic job designing Heather's stationary suite; setting the stage with a spectacular boxed invite. 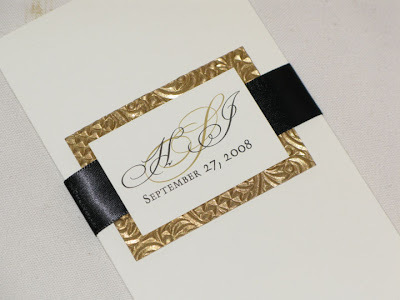 The gift-like box opened to an embossed gold luxe wrapper tied with a black satin ribbon; further leading to an ecru cotton stock letterpressed with metallic gold black writing. STUNNING. 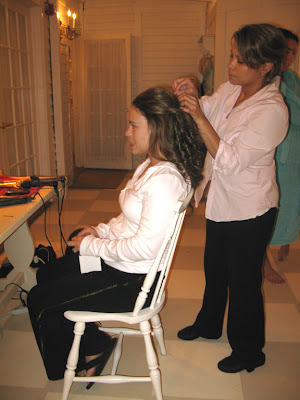 On Saturday, September 27, the ladies began getting ready bright and early at The Cottage House, a sister property of the Manor. This darling shabby chic cottage would have made Rachel Ashwell proud with its whitewashed furniture, jute rugs and slipcovered chairs. Just being there made everyone calm and cheery as they brunched and were beautified by Yazmin Mendez's hair and make-up. Yazmin was a total powerhouse that day and everyone looked gorgeous. During this time, Talia and I were busy ensuring everything was in place over at the Manor. Stoneblossom pulled up with their truck and began carting in their magnificant flowers, starting with the bouquets. 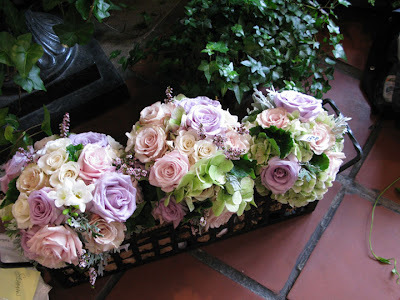 Heather carried a modern cascade or roses, orchids, stock and freeshia, while the girls carried bouquets of purple sterling roses, hydrangea and begonea leaves. 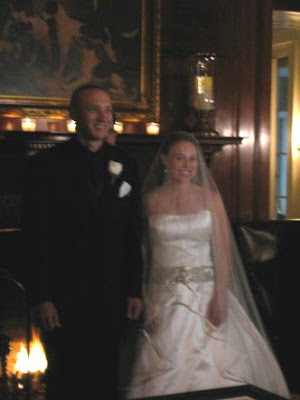 The ceremony began with the signing of the ketubah with Heather, Jason, their immediate family members and chosen witnesses in the Drawing Room. Heather wore a Lazaro gown (purchased at Mariella's)with the most breathtaking Amsale ribbon edged veil I have ever seen. It was so sheer, so soft, so shimmery, so there and yet so not, it was like air. . . . ooh, I get tingles just writing about it! Her maids wore black dresses of various designers. The gents wore black pinstriped suits and black shirts. Jason sported gator shoes which were v. cool. 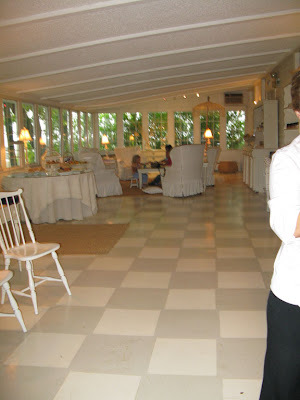 Due to the pending rain, Heather and Jason were married at 6:30 in the Conservatory in the Jewish tradition. 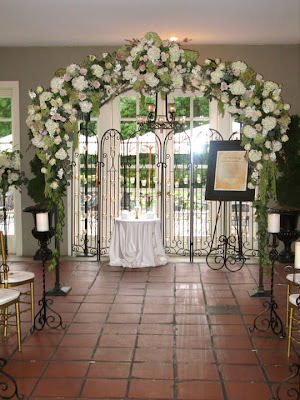 The back-up plan worked effortlessly as the Manor had a gorgeous arbor for Stoneblossom to decorate with soft and vintage greens and blooms. Millennium accompanied the ceremony, featuring a pianist who also specialized in country vocals. Heather walked down the aisle to "I Loved Her First" by Heartland. With the pattering of the rain on the glass windows, it was incredibly soft and intimate. So lovely!! With the breaking of two glasses and a kiss, the ceremony ended and cocktail hour was in full swing. 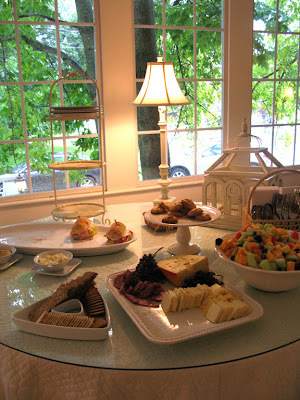 Millennium played light jazz and the guests enjoyed mingling with one another and sampling yummy apps of all kinds. 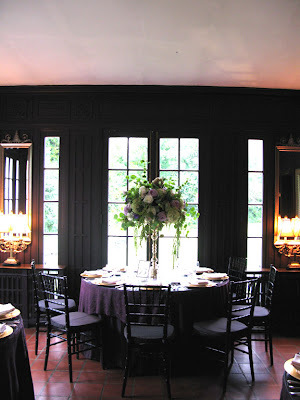 There are four separate dining rooms at Lord Thomson Manor, each with a distinct color scheme and decor style. 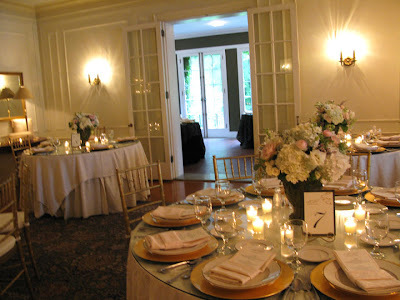 Taking this into consideration, we designed the florals for each space to complement their respective pallettes; yet at the same time to also play off the decor and flowers to the ballrooms in which they were juxtaposed. It came together brilliantly . . and the staff at the Manor said they had never seen centerpieces like that of Heathers. Eeeeee - we were thrilled!!! 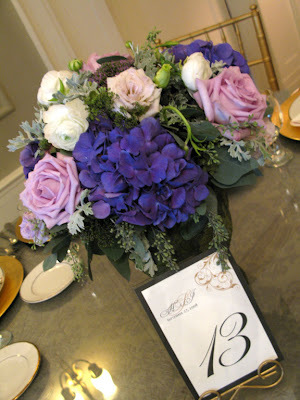 In Breakfast, a room of very strong and majestic purples, we chose high centerpieces of the most perfect proportion to the smaller room, filled with creamy white roses/stock/lisianthius, antique green hydrangea, and antique purples of all kinds. Close up of the glorious centerpiece! Hunt, which adjoins Breakfast, is a cool and calming pewter. As such, we chose various antique purples, greens and whites placed in aged stone urns to pop against the background as well as tie in the deep and sensual purples next door. The purple hyndrangea, in particular, were delish! The mantles were decorated with candles and glass of various heights. The photo is Heather's parents wedding photo - a sweet touch! Table numbers and menus were designed by Talia. In Belmont, or the shabby chic rooom as we all called it, mossy urns were filled with creamy white and blush roses, hydrangea, Queen Anne’s lace, freesia and other pale goodies. I could have sat in this room all day. Sigh. Finally, a stunning and tighly packed high centerpiece of 75 roses on a gold candelabra play off the bohemian aristocratic deep taupe in Terrace. 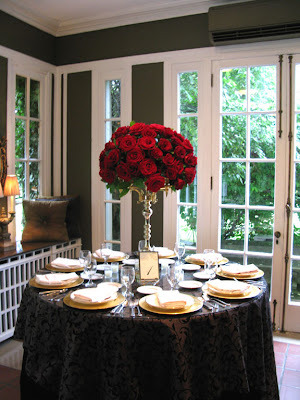 I *LOVE* the blood red contrast against the moody masculininity of this room, as well as the dainty whites of Belmont. Totally bananas . . . all of it. 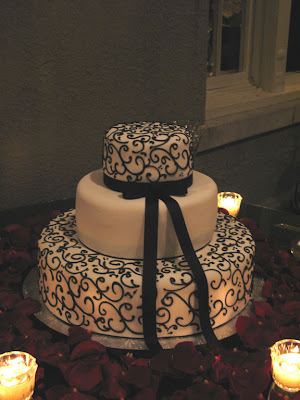 Donna of Creative Cakes provided the cake. Scrumptious inside and out! 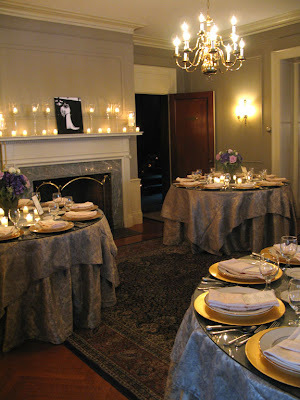 Following dinner, the guests danced the night away to Radiance, from Boston. The lead singer was a hot ticket and belted out some great sets. One of the perks of having your hair and make-up team stay extra long is that they can constantly touch up make-up and restyle hair, if need be . 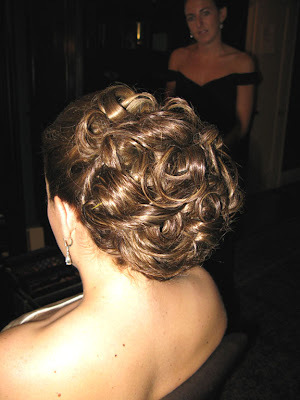 In a flash, Yazmin took Heather from soft and romantic to high and elegant, perfect for dancing. Sam Chinigo was the photographer and David Lammey the videographer. We are anxiously awaiting to see their final products! Heather and Jason, I had so much fun working together over the past year on your day. All our hard work truly paid off as it came together just as we had imagined. I hope the two of you had a wonderful honeymoon in Costa Rica, as it was much deserved. We wish you a wonderful life together. Please do keep in touch!